Are Active Shooter Drills Harming More Than They're Helping? Some teachers have reported being shot with pellet guns and experiencing ongoing trauma after the drills, yet the effectiveness of the training is unproven. 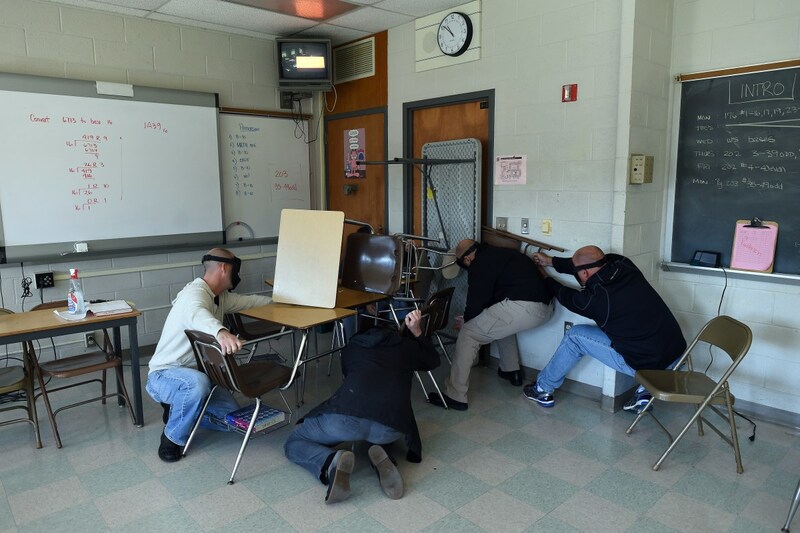 "Students" barricade a door of a classroom to block an "active shooter" during ALICE (Alert, Lockdown, Inform, Counter and Evacuate) training at the Harry S. Truman High School in Levittown, Pennsylvania, on November 3rd, 2015. While this incident is an extreme example, it&apos;s not isolated. Teachers in several other places have reported difficult experiences with active shooter trainings. And it raises the question: What kind of oversight and accountability do the organizations offering active shooter trainings have? For the most part, teachers and school officials understand the need for active shooter preparedness. Teresa Meredith, the president of the ISTA, says, "We appreciate the active shooter trainings, but we certainly want to see the law changed so that there cannot be projectiles used in these trainings." The ISTA is lobbying to have language included in a school safety bill in the state that would prevent these kinds of tactics from being used on teachers. Wendy McNamara, a Republican state representative, is the author of that bill. She is also a high school principal who conducts and participates in active shooter trainings for her own school. "I was surprised that anyone would use pellets or anything like that in a training drill, especially without any notice to the teachers," McNamara says. She calls including language in a bill that would protect teachers from such tactics "common sense." But, considering the emotional distress that teachers report experiencing during some active shooter trainings, does prohibiting teachers from being shot at go far enough? In addition to being shot with pellet guns, the Indiana teachers were instructed not to tell their colleagues next in line what was about to happen to them, which, Meredith explains, "was also traumatizing." Elementary school teacher Jody Lickhart had a similarly traumatic training experience in Ames, Iowa. She has struggled with relentless anxiety ever since she endured an "absolutely terrifying" active shooter training in her district just before school began last fall. "We were headed down the stairs to try and escape, and [the "shooter"] met us at the stairs. So then we turned around, we ran back in, we barricaded ourselves," Lickhart says. "We were told to call 911, and you couldn&apos;t get through, and we were told to text 911 because they had a new system where you could text 911, and every time you would text them it would come back, &apos;We are unable to take texts right now.&apos;"
Another scenario they practiced involved the "shooter" pretending to be a police officer calling an all-clear to try to get the participants to open the door. Lickhart knew it was fake the entire time, but, she says, "I was still shaking." Lickhart went over scenarios in her head the night before school began. She began "almost an obsessive, constant thinking of it," and she struggled with welcoming kids and conveying her classroom as a safe place, all while wondering, "but is it really?" After a couple of months, her anxiety had not subsided, and her instructional coach asked her if she had thought about seeing a therapist. "I&apos;m like: &apos;I should not have to see a therapist because of my job. This is ridiculous.&apos; But, I did," Lickhart says. Her therapist explained that Lickhart was experiencing compassion fatigue and secondary trauma as a result of the training. 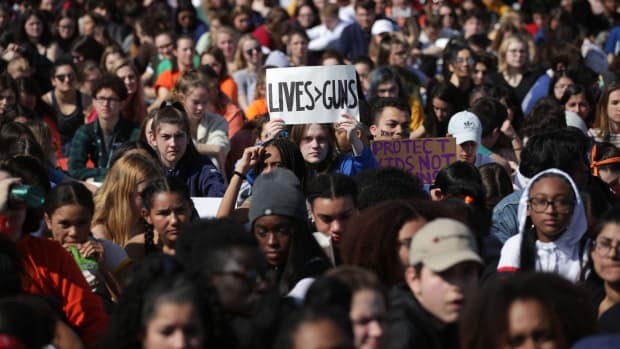 Teachers are petitioning lawmakers for protections during these trainings because states prepare school safety policies, and they hope that legislators can offer additional scrutiny about the tactics of such programs. McNamara says that Indiana follows both state and federal school safety task force recommendations, both of which include active shooter preparedness training for teachers. The recommendations do not specify, though, what tactics that training should or shouldn&apos;t include. The for-profit nature of some training organizations is another area that Meredith says deserves scrutiny. She&apos;s concerned about who might have a vested interest in companies that she says are "charging exorbitant amounts for these trainings." A Pennsylvania newspaper reported last year that, in one district, the cost of ALICE (Alert Lockdown Inform Counter Evacuate) Training—the most prominent training organization in the country—was estimated to be greater than $125,000. Teachers and teachers&apos; unions aren&apos;t the only ones with concerns. 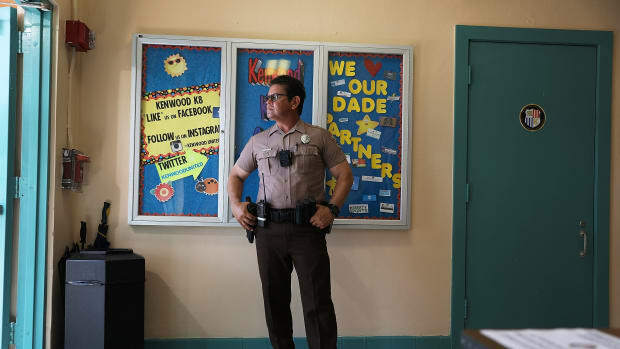 Some school safety experts, like Michal Dorn, executive director of the non-profit campus safety organization Safe Havens International, have also taken issue with training tactics. Dorn is worried not just because of the trauma and injuries some teachers have endured, but also because, he says, those trained in Run, Hide, Fight (also known as options-based or multi-option training) methods perform worse in his simulations than those who haven&apos;t been trained in that way. When Safe Havens goes into schools and runs simulations, according to Dorn, it&apos;s clear which staff members have had prior training. "The ones who have the training, they miss more life and death action steps. They forget to order lock-down, they forget to call 911, they forget to lock the door, they forget to pull fire alarms in a fire. So that&apos;s of great concern," Dorn says. Beyond forgetting steps, Dorn says that people with prior options-based training make wrong choices too. Instead of using de-escalation techniques with someone threatening suicide, for instance, one in four participants with prior training attacks the person in distress. 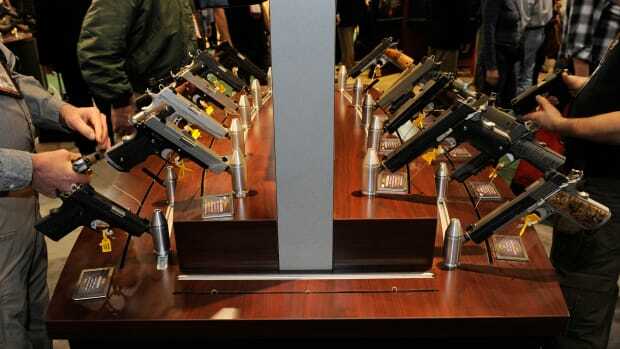 And 30 percent charge at a distant gunman when the better choice, according to Dorn, would be to run or hide. Safe Havens&apos; scenario-based testing prompts participants to think on their feet and respond differently to each scenario. In short, Dorn says, "If it doesn&apos;t test well, it ain&apos;t gonna get better when you add stress." The mistakes, Dorn says, stem from a combination of factors. For one thing, the focus on only three or four protective actions that apply only to a very narrow situation (in-the-building active-shooters) limits participants to only those actions. "As a result, they often do not think of even the most basic and simple things," Dorn says. In addition, he says that Safe Havens is encountering school employees who are so frightened by prior training that they become very upset while trying to do even simple scenarios. So, if the techniques are resulting in trauma and the outcomes are unproven, who, if anyone, is overseeing programs to ensure that teachers—and eventually students—aren&apos;t being emotionally or physically harmed by them? Meredith says, "We don&apos;t believe there&apos;s any oversight right now being done." Moreover, according to Dorn, some training organizations require participants to sign waivers that absolve the organization from liability. In some cases, these waivers have resulted in litigation against school and police officials instead. "So right now the accountability has been through workers&apos; comp complaints and litigation against districts and police departments," Dorn says. For lawmakers to better understand what teachers are experiencing, McNamara believes it would be beneficial for them to observe these trainings in person. "If the people who passed the laws actually had to experience a lot of what goes on in the classroom," she says, "I think they would think differently of the laws that they passed." The recent Parkland student suicides call attention to the long-term effects of school shootings on mental health, academic performance, and economic achievement. 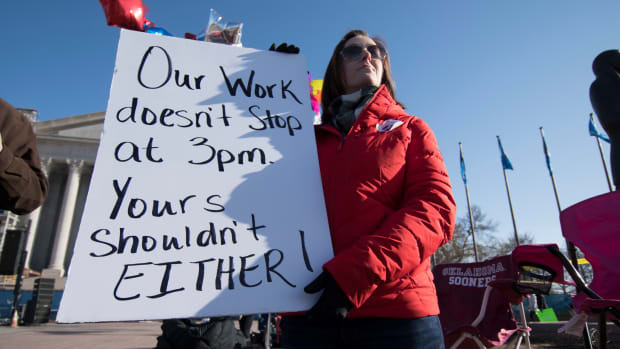 Is a new model of teacher protest emerging? Research indicates that new security measures implemented after Parkland are not making students safer. As the Trump administration and NRA continue to push the idea of arming teachers, what are the actual statistics around putting more guns in schools? 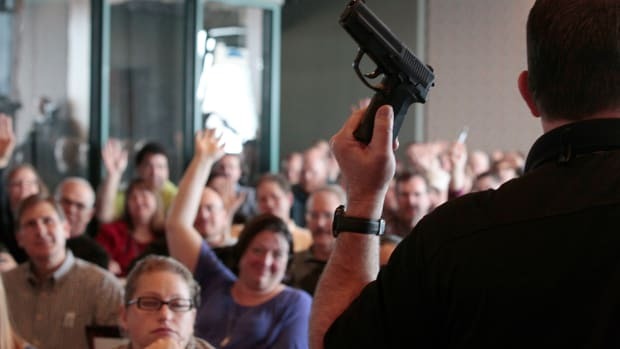 Should Teachers Carry Guns? In Many Rural School Districts, They Already Are. While a national debate about whether or not to arm teachers rages on, hundreds of school districts across the country have been allowing staff to carry weapons on school property for years.